I basically took ideas from the frog cupcakes already posted. I made chocolate cupcakes, tinted frosting green and frosted the cupcakes. Then I took large marshmallows and cut them into thirds making three circles. I then cut the bottom quarter off each marshmallow circle to make it flat on the bottom (think dome). I took black frosting and piped eyes onto the marshmallows and placed them on top of the cupcakes for the eyes. 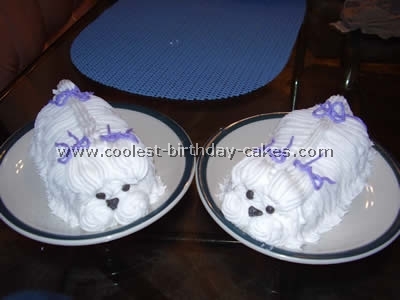 I then used pink frosting and piped mouths. My daughter is asking for a Frog theme for her third birthday and I found cute girl frog invitations that are pink and green polka dots so that’s why I went with pink for the mouth. I did try using a red and it looked cute too. So thanks for the great ideas! 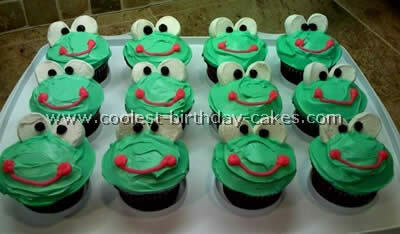 For these cute frog cupcakes, you will need to make a batch of frosting and tint green with food coloring. Or, you could "cheat" to save time (like I had to do this time) and buy a large container of pre-made whipped frosting and tint it green. You will also need a small amount of white frosting and pink frosting in decorator tubes. Frost the frog cupcakes with a slight dome-like shape to them. Add 2 green peanut M&M’s to begin the eyes. Using the white tube frosting, add the brown Mini M&M’s to complete the eyes. Use the pink tube frosting to add a little smile; change the tip to make "cheeks" at the ends of the smiles. These cupcakes are so very easy, and so very cute to make. Our turning-6-year-old daughter and her friends just LOVED them! 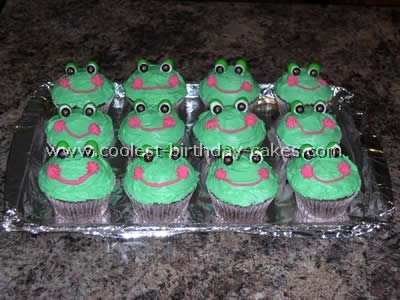 I modified several different frog cupcakes ideas to come up with the best one for us, and I’m sure it will be a hit for you! It’s easy, fun, and the whole family can help. First we baked all our cupcakes (any flavor). Then took white chocolate candy melts (the ones used for candy molds), chocolate chips, and plain white frosting for glue. The kids and I put a dab of frosting on the back of a chocolate chip, and stuck it onto the flat side of the candy melt. Once all our eyes were assembled, we colored some frosting green, stuck two eyes in each frog, and then sprinkled with a little blue and green sugar crystals. We had SO MANY COMPLIMENTS, and it was so very easy. Hope you have a hoppin’ party! I made these frog cupcakes for a going-away party for my daughter’s daycare teacher. (She was having a baby, and did her nursery in frogs). 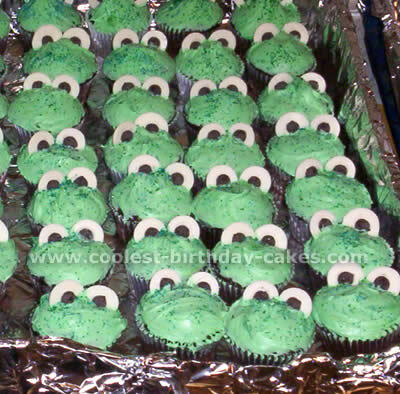 I made 24 frog cupcakes using a standard confetti-style cake mix. I frosted the cupcakes with a can of white icing I had tinted green using Wilton Color Paste in Sky Blue and Lemon Yellow. 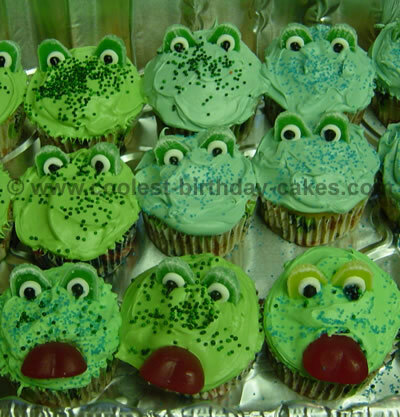 I sprinkled some Green Sparkle Sugar on top of each frog cupcake to add texture and to match the eyes. The eyes were constructed by cutting large marshmallows in half depth-wise and in half again to make half-moon shapes. These were then SLIGHTLY dampened with a wet pastry brush on all but one of the flat sides and then rolled in Green Sparkle sugar. 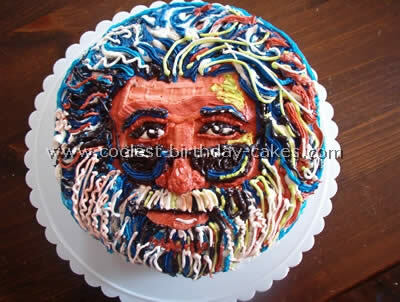 Finally the eyes were made using black decorator’s icing in a tube. I then pushed the eyes onto the backs of the cupcake tops. I made two small black dots for the noses, and drew smiles with black icing. I then cut refrigerated red fruit roll ups with scissors to make the tongues and inserted them into the mouths. These frog cupcakes were quite the hit! 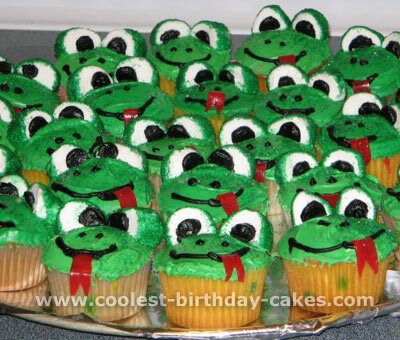 These are Frog cupcakes I made. I frosted them green and added green round sprinkles ("non-pareils"). For the "eyes", I took a green gum drop, cut it in half. The white parts of the "eyes" are mini-life savers. For the center, I used black frosting in a can. For the mouth on some of the cupcakes, I used the top of some heart shaped gummies.